At the first signs of spring, even the most casual gardeners see visions of summer blooms and dream of bountiful harvests. Garden soil is tilled, terra cotta pots are filled with potting mix, and seedlings are eagerly planted. For those who haven’t finished planting this season, or who haven’t had time to carve out space in their front or back yards, consider forgoing the effort of constantly watering small pots, or trying to prep and fertilize a huge section of garden soil, in favor of a popular way to garden: raised beds. Apartment or townhome dwellers who lack the lawn to convert to a garden can harvest bushels of delicious vegetables grown in raised beds. And even if you have all the land you need to plant directly into the ground, raised beds offer distinct advantages over traditional in-ground gardening. A raised bed can take various forms. Some sit at ground-level and are built right onto a lawn or garden area. If you have land, you can create inexpensive raised beds—with or without a bottom—with a quick trip to your local lumberyard or home improvement store. If space is tight, garden centers sell what are called “elevated raised” beds, freestanding trough-like units that are supported on four or more legs. These can be positioned wherever you have deck, driveway or balcony space. 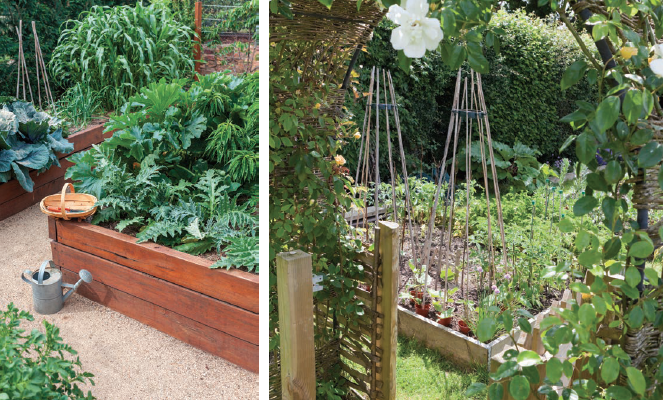 Whether they are built on top of the ground or elevated, raised beds offer many benefits. They also have a few drawbacks to consider in your planning. Containers, such as large plastic pots or even large whisky barrels, also offer this—but they are smaller, and the resulting yield will be smaller as well. Vegetables grown in larger raised beds will tend to be bigger than those grown in pots, and raised beds don’t need to be watered as often as containers. A downside to some raised beds is that, depending on the size of the bed, your vegetables may potentially be smaller than those grown directly in the ground. In addition, you will need to pay closer attention to watering. While raised beds retain water better than containers and pots, they need to be watered more frequently than an in-ground garden. Weeding a raised bed is easier because you are filling it (at least initially) with relatively weed-free, store-bought soil versus battling years of weed growth that has taken place in your existing garden. And because they often comprise a smaller area, raised beds are simply easier to maintain. The soil is also loose, so weeds come out easily. Elevated raised beds are even easier to maintain. Weed seeds are less likely to blow into them, creating less weeds overall. And for anyone who wishes to avoid back strain, an elevated raised bed also allows you to tend your garden with minimal bending. If your backyard has a lot of trees, you may find your garden soil is like a tightly woven web of tree roots. Those can choke out the roots of garden plants, stifling growth. Raised beds with bottoms, or elevated raised beds placed around your garden, will avoid that. 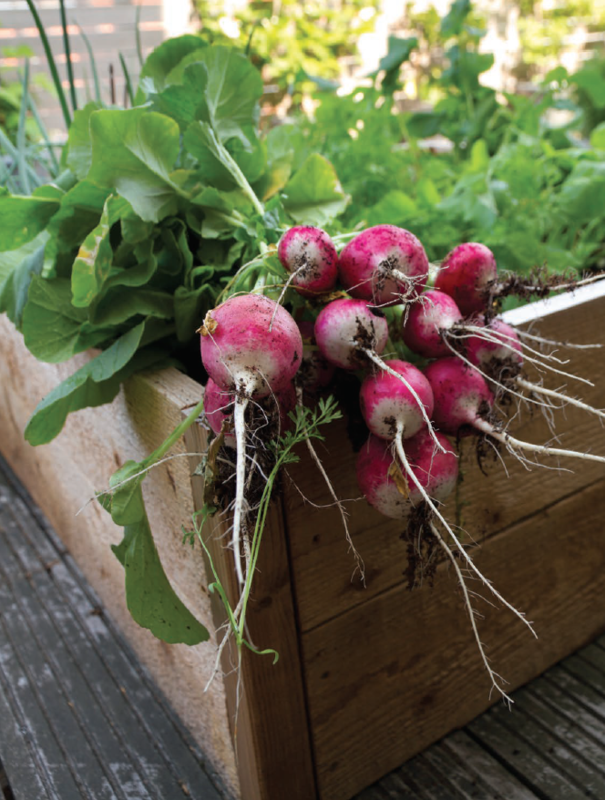 For gardeners who want to have crops throughout the seasons, raised beds are ideal for compartmentalizing vegetables and plants by growing temperature. Dedicate a few beds to early spring plants like spinach and cilantro that can tolerate cold. Then, prepare a few more beds when weather warms up and dedicate those to tomatoes and basil. Then, while your warm weather beds are still producing but after the first cold beds have died back, you can return to the cold weather beds for late summer and fall plantings, tilling the soil a bit and amending with compost or fertilizer if needed. You can also dedicate smaller beds to invasive plants—like mint—allowing the plants to grow freely in the space while preventing them from taking over your whole garden. Another benefit: Raised beds usually warm up faster than the ground, giving vegetables a head start after you first plant them. If you are creating a raised bed on top of your lawn or backyard, it’s very easy and inexpensive to build your own. Simply buy lumber to match your space, creating square or rectangular boxes in the sizes you want. Remember that wood needs to be untreated, to avoid chemicals leeching into the vegetables and herbs you will eat. Purchase multiple sturdy brackets and screws and attach to the inside of each corner with a power drill. If you don’t want to build your own entirely from scratch, you can purchase pre-made corners, often with stakes to anchor them to the ground. Purchase lumber separately and simply slide the lumber into the corners. Or, you can buy whole ready-to-assemble sets made of wood or even plastic. If you have space and a tree-free area, you can have raised beds without bottoms. To take full advantage of your ground area, till the soil before building your raised bed over it, so it’s loose and aerated. Build the wooden sides, and then fill with purchased soil. You will enjoy many of the advantages of a raised bed while giving plants some extra depth to grow right into the ground. If your backyard ground is just too packed to till, no worries. Just build your bed on top. Your vegetables and herbs may have a harder time growing deep roots, and won’t grow as large as plants with loosened garden dirt, but they’ll benefit from more stable water levels if they have some access to the ground. If your backyard has a lot of trees, add a bottom to your raised bed. If it’s made of wood, it obviously won’t last forever, but it will prevent the roots from taking over your raised beds for a good while. Raised beds with bottoms will have some of the drawbacks of containers as far as having shallower soil and drying out faster, but still will perform far better than pots. Purchase a mix of container or potting soil and regular garden soil which will prevent the raised bed dirt from becoming too dense and packed. Add compost and fertilizer as well, and plan to add these every year to “recharge” your soil. You can buy soil in bulk if you are filling several raised beds. Otherwise you can purchase by the bag. (You can also find soil calculators online to help determine how much you need to fill your raised beds based on cubic feet.) After a year or so you will need to add more soil, since it will run off or out of your beds, so start with as much soil as you can fit, filling the beds to the top. While it’s relatively simple to DIY a garden bed, elevated beds are more complicated, so you will likely want to purchase them. And there are some wonderful options out there. Basic elevated beds will likely be all wood, in a rectangle. Fancier versions might feature wooden frames with cool galvanized steel sides. Or the opposite—beautiful cedar sides held together with painted metal frames. Some are all galvanized steel, in silver or bright colors, and some are oval or triangular. You can make your yard as classic or whimsical as you like. Some elevated beds are extremely deep, with sides that go from the ground to waist high. But most of them feature a few feet of elevated trough held off the ground, leaving nice sightlines on your deck or patio. You can even buy an elevated bed that doubles as a patio bar! Some are on wheels, allowing you to move them around a smaller patio to maximize sunlight. Others feature practical growing options, like trellises or cold frames. You can also buy shallower versions and decorate your patio or deck with little herb beds. Not all have straight bottoms either. Some have rounded or V-shaped bottoms that look less boxy, but still allow for deep-rooted plants like tomatoes to grow. You simply plant them in the middle and plant smaller plants, like herbs, on the edge. Elevated beds will require less soil, but you will need to line them all with special plastic that allows water to pass through while retaining soil. You will need to water them more often than your garden beds, and you will not be able to plant tall vegetables like corn. Elevated beds are better for plants like cherry tomatoes, hot peppers and herbs, along with small crops like lettuce and spinach. Take time to visit several garden centers and home improvement stores to see what’s available. 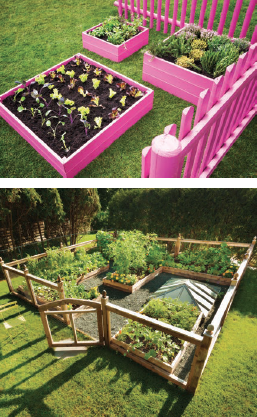 When choosing where to place or build your raised beds, aim for the sunniest spots you can find. To maximize the types of plants you can grow, choose spots that get at least eight hours of full sun every day. If you are building beds on top of your garden or backyard, try to avoid areas with poor drainage. While you want to keep water levels consistent, you don’t want your plants in soggy, muddy areas. On the flip side, you will likely need to water your plants versus relying solely on rain, so make sure both elevated and garden beds are located near a hose or rain barrel, or purchase hose extenders so you can take the water where it’s needed. For placing elevated beds, think about how the bed will look at the end of the season. You might like to see cute tomato seedlings outside your kitchen window in May, but not like them so much when they are sprawling bushes in August. Because raised beds allow you to maximize and control the fertilizer in the soil, you can pack quite a few plants in that space without them competing for nutrients. You’ll have much more usable space to grow multiple vegetables and herbs together. Keeping the plants closer together also helps prevent weed growth, and allows for maximum shade for the soil, helping prevent it from drying out. However, don’t crowd them too much. Plants need access to sun, water and air. Airflow allows leaves to dry out after being watered or getting rain, helping prevent disease. You should also be mindful of how you plant. Depending on where the sun is, place taller plants in back or in the center, and lower plants in the front or around the edges. You should also use cages or poles to train tomatoes, cucumbers and other vegetables to grow up, further maximizing space. As with all gardens, monitor for growth and overall health and, if needed, add a fertilizer to bolster plants. 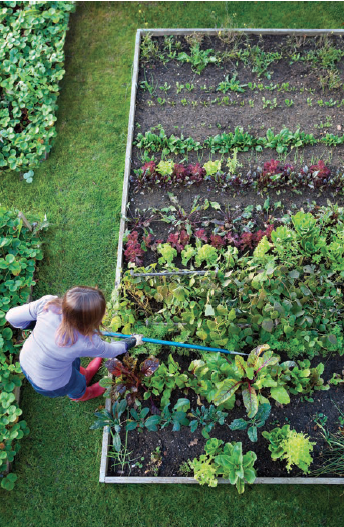 Rotate crops year-over-year, swapping your spring/fall and summer beds each season. This helps prevent plant-specific diseases, such as tomato blights, from returning. Elevated and raised beds can and should be placed and planted with an eye toward decor. 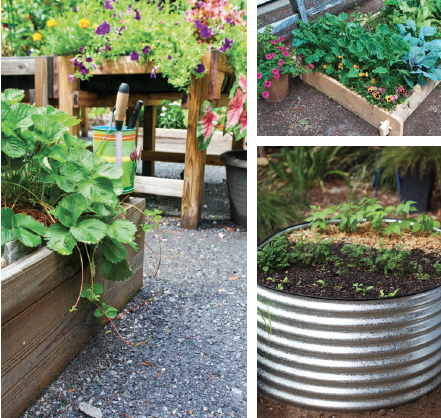 Large-scale vegetable planters can be arranged strategically on a patio to frame out an outdoor living space, while raised garden beds can be used to add color, texture, order and definition to an otherwise boring backyard. 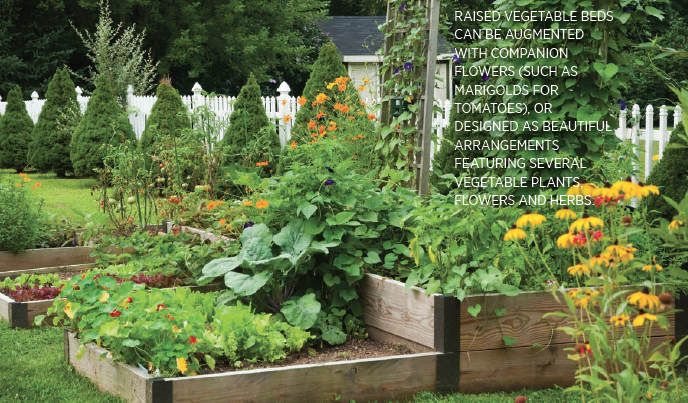 Raised vegetable beds can be augmented with companion flowers (such as marigolds for tomatoes), or designed as beautiful arrangements featuring several vegetable plants, flowers and herbs. You can mix a few different varieties of colorful cherry tomatoes with eggplants and pepper seedlings, a few herbs and some nasturtiums. Use your imagination to create beautiful, edible garden features that you can enjoy this season, and for many seasons to come.